God could have created 500 immaculately conceived leaders for each generation to rule flawlessly like Plato’s philosopher kings. We don’t know why He didn’t do that, but we do know that God used improbable people to lead his flock generation after generation in the Old and New Testament times. Why pick a stammerer as the greatest leader of the Chosen People besides David, an adulterer? 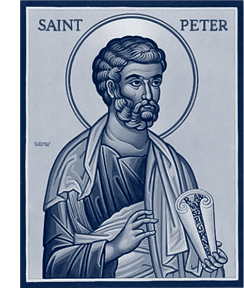 Why Peter, the denier, as the first Pope? Many sermons have been given emphasizing the humor in this strange strategy of God. How can we apply these lessons to ourselves? The question came to me in prayer this morning when I was noticing my manic tendency even at 73 years old to pile up project upon project (I call it project-itis). It seemed to me that the Holy Spirit was telling me that given His personnel shortage if He wants to launch a venture, He often has to use high energy slightly unbalanced types to do it. Your serene and laid-back fun-living type is harder to motivate. That doesn’t mean that God doesn’t want to help me pace myself better with more time for quiet prayer. He does. But , perhaps, since He knows I will resist, He bring good out of this bad but using my projects amply. How does God use your faults while also trying to lead you to greater virtue?